Things You Will Need: Tassel maker, string, scissors. Tassels can be made as long or as short, thick or thin, as you want them to be. Plus you can use just about any kind of string or yarn that you like or that you have on hand. 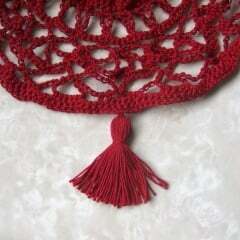 Tassels add a nice touch to various different projects such as purses, ponchos, scarves, curtains and many more. 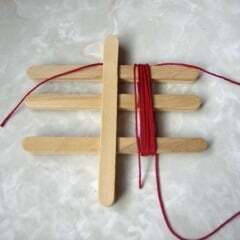 Anyone can make them as they are quite easy to make. If you’ve never made them before just follow the step-by-step instructions below and you’ll be a pro in no time. 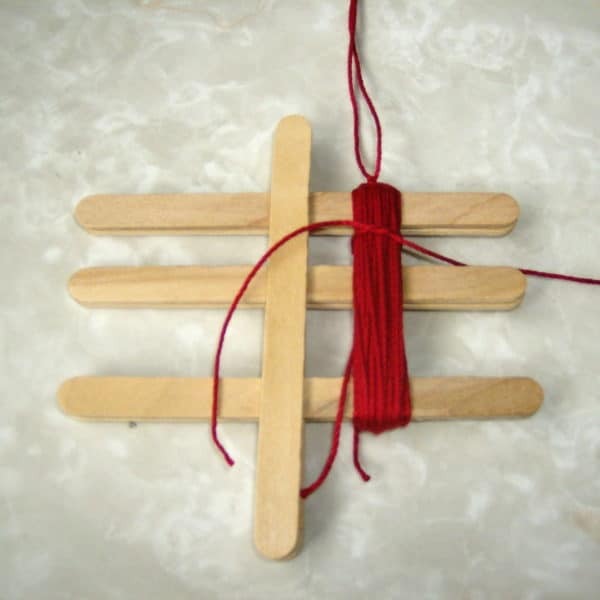 Here are the instructions on how to make the tassel maker used in the demonstrating pictures. 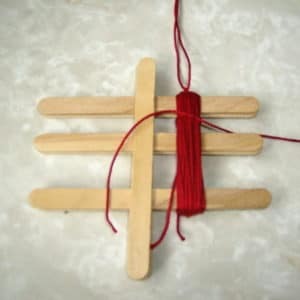 Step 1:Cut a string long enough to allow for a knot at the top and still be as long as the rest of the tassel strings. 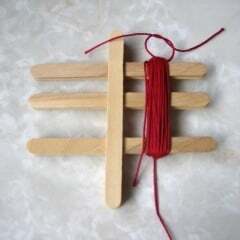 Place this string on top of the tassel maker as pictured. 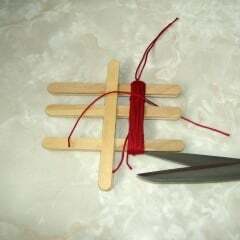 Step 2: Take the string and wrap it around all three sticks as many times as you like. 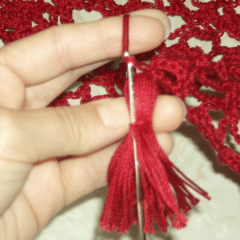 The more wraps you do the thicker and fuller the tassel will be. Note: If you’re making more than one you’ll want to keep track of how many wraps you do to make sure they are all the same thickness. Step 3: After the desired wraps have been made, take the string at the top and tie a tight double knot at the top. Keep these ends separate from the other tassel strings as these are the strings you will later use to attach the tassel to your project. Step 4: Cut another string about as long as the first string in step 1. 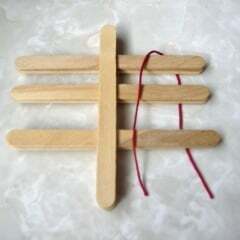 Bring this string around the tassel strings in between the top two sticks and tie one knot as pictured.DO NOT tie a double knot at this time. 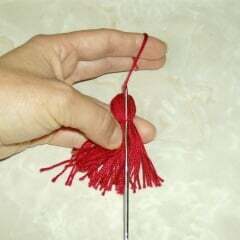 Step 5: With a scissor or an exacto knife cut the tassel strings at the bottom, including the string used to make the wraps. Step 6: Now take the knot made in step 4 and tighten it, and make a double knot. 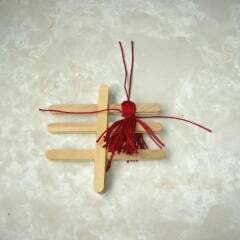 You can now remove the tassel from the tassel maker. Step 7: Insert a crochet hook from the bottom underneath the double knot just made. Grab the two strings from the knot and pull under and through. 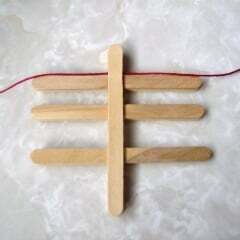 This hides the knot and the two ends become a part of the tassel strings. Step 8: Trim off any excess strings at the bottom. Now the tassel is ready to be tied to the project using the two ends on top. 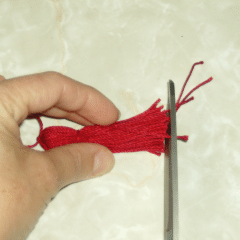 Step 9: After you have fastened the tassel to your project you again want to insert the hook underneath the string as in step 7, and grab the two ends used to tie the tassel and pull them through make them a part of the tassel strings as well. Again trim off the excess ends.